Arrestins preferentially bind active phosphorylated GPCRs. Receptor binding is associated with a global conformational change in arrestins. These findings lead to a model where arrestins have distinct sensors for the receptor-attached phosphates and active receptor conformation, and that simultaneous engagement of both sensors by corresponding parts of the receptor induces binding-associated conformational change. Receptor-attached phosphates perturb two intra-molecular interactions in arrestins that stabilize their basal conformation: the polar core between the two domains and the three-element interaction that anchors the arrestin C-tail. Indeed, mutations that disrupt those interactions yield “enhanced” mutants capable of binding active receptors regardless of their phosphorylation. 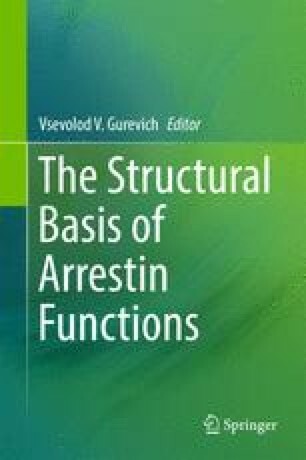 Structural and functional characterization of these mutants lead us to propose an allosteric regulation model for arrestin. Further, it was proposed that these mutants can compensate for defects in GPCR phosphorylation, including those caused by mutations, thereby serving as tools for gene therapy of these gain-of-function GPCR mutations. This idea so far was tested only in the visual system, where partial compensation for lack of rhodopsin phosphorylation was reported. These proof-of-concept experiments suggested that this approach works, but more powerful phosphorylation-independent mutants are needed in photoreceptors using the fastest, most sensitive, and most demanding GPCR-driven signaling system.